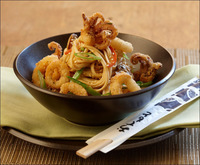 Our “try it and you’ll love it” calamari are tenderized and coated with seasoned breadcrumbs to deliver unmatched flavor in a crunchy, tender bite. Its back-of-the-house, hand-breaded look adds appeal for guests and operators alike. 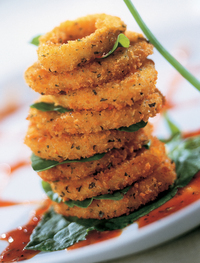 An increasingly popular and versatile treat, Mrs. Friday’s® Calamari Rings add distinction to any menu. Do not thaw or overcook. Fryer: Fry in clean oil at 350°F/177°C for 1 minutes or until golden brown. Conventional Oven: Preheat oven to 425°F/220°C and bake for 12-14 minutes or until golden brown. Convection Oven: Preheat oven to 400°F/206°C and bake for 10 – 12 minutes or until golden brown.